Sundays — Sat evening: 4:30 p.m.; Sun: 9 a.m., 11 a.m. In the early 1800s, priests serving the diocese of Bardstown rode the mission circuit and visited the scattered Catholic families in Meade County about once a year. The first church in Brandenburg was erected by Father John Thomas O’Connor in 1892 and was named St. George. This church was struck by lightning in 1919 and destroyed. A new building was also destroyed by lightning in 1920. As a result, except when the priests celebrated the Eucharist in individual homes, people attended Mass in neighboring parishes. In 1931, St. George was a mission of St. Mary Magdalen of Pazzi. That same year, John Kelly, the father of the future Princess Grace of Monaco, made a large contribution through the Catholic Extension Society, which made possible the construction of a church building on Old State Road in Brandenburg. The church was named for Kelly’s patron, Saint John the Apostle. In 1950 Archbishop John Floersh purchased 19.6 acres, which became the site of the current church. St. John was raised from mission status to a parish in 1960. It soon became apparent that the additional Sunday Masses could not accommodate the ever-increasing number of parishioners. Construction on a new church began, and the first Mass was celebrated in the current church on Saturday, March 29, 1980. The church was dedicated by Archbishop Thomas J. McDonough on September 14, 1980. A parish center was added in 2000. The Missionary Servants of the Most Holy Trinity were assigned the care of the parish from 1957 until 1982, when diocesan priests returned. An elementary school operated from 1965 to 2005, first staffed by Augustinian Sisters from Malta. Today, St. John the Apostle is vital and growing with a wonderful lay staff. It has active committees, a variety of religious educational programs, and worship, service, and social opportunities. 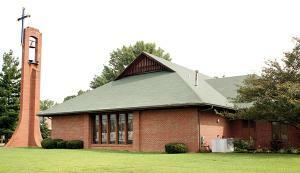 The parish is a close and caring faith community of nearly 1,200 parishioners.